A deaf dalmatian can lead a normal, happy life. With 10 to 12 percent of the breed being born deaf, dalmatians have the highest incidence of inherited deafness, according to the ASPCA. A dalmatian requires you to be energetic, active and patient. If you have the time, this is a highly trainable breed with or without hearing. Learn sign language for commands. The basic commands are sit, down, stay, come, no and stop. Add additional words after your dog learns these commands, according to Susan Cope Becker, author of "Living with a Deaf Dog." 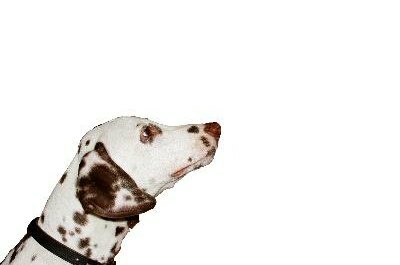 A deaf dalmatian trained with sign language can recognize a sign across the yard. To get your dalmatian’s attention try waving, stomping your foot to create vibrations or turning a light on and off. Keep your dalmatian leashed during walks, in unfenced yards and at the park. If your deaf dalmatian instinctively chases a squirrel or rabbit, he can't hear you yell or hear honking cars if he runs into the street. Reduce your dalmatian’s startle reflex. Walk up behind your dalmatian and gently touch his shoulder. As he turns around, immediately put a treat in his mouth, according to Becker. This teaches your dog to expect good things when touched unexpectedly. If your dog is sleeping, gently touch his shoulder while holding a treat in front of his nose. Tell your dalmatian you're leaving. If your dog can't find you, he becomes anxious. Give your dog a treat and make sure he watches you leave. If he is sleeping, wake him up and have him watch you walk out the door. You can also teach a sign that you're leaving. Attach a bell to your dog's collar so you can hear him in the house or the yard, according to the ASPCA. Also attach a tag to the collar indicating your dog is deaf. Use a 30- to 50-foot web leash or flexi-leash to exercise your dog at the park, Becker says. Use a flashlight or laser pointer to get your dog's attention. Never allow visitors, especially children, to wake your sleeping dalmatian. This can startle your dog and cause the visitor to be bitten. Not being the pack leader of your dalmatian can lead to training difficulties. The breed becomes mentally unstable and high-strung if he does not receive enough mental and physical exercise. Half the people who adopt a dalmatian puppy do not keep the dog past the first year, according to Dog Breed Info Center. A deaf dalmatian increases the responsibilities of ownership, so be sure you have the time and energy before taking on a deaf dalmatian. Do Collies Get Degenerative Myelopathy?